Through our Holiday Courtesy Vehicle Program, you will receive special savings! This very low mileage, gently driven vehicle, has a substantial reduction in price and is still under factory warranty. Holiday Courtesy Vehicles don't last long! Come in for a test drive today! With Holiday Certified Pre-Owned Vehicles, you receive a FREE vehicle history report and as well as a 2-Month/2,000-Mile Limited Powertrain and Major Systems Warranty at no additional cost. You can count on your vehicle having passed a complete 124-Point Quality Inspection and a road-test administered by skilled ASE Certified Technicians. With Holiday Certified Pre-owned you don't just get a great vehicle, you get peace-of-mind. 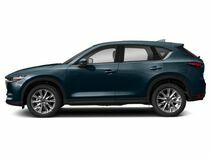 See Holiday Mazda for complete details. Call Now Toll Free! 1-(866) 875-3224. Check out our Full inventory at www.holidayautomotive.com. Holiday Mazda in Fond du Lac, Wisconsin has been a family owned and operated dealership since 1959. We are located at HWY 41 and HWY 23 at Exit 99. We are pleased to offer ON THE SPOT FINANCING. BAD CREDIT OR GOOD CREDIT, we work with over 20 banks to get you APPROVED AT THE MOST COMPETITIVE RATES. We provide AIRPORT TRANSPORTATION and NATIONWIDE DELIVERY OPTIONS. At Holiday Mazda we are worth the trip!